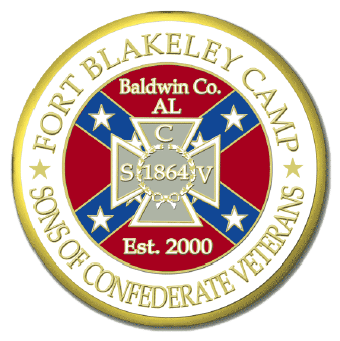 Fort Blakeley Sons of Confederate Veterans Camp #1864 was established in 2000 and serves the Baldwin County, Alabama area. Camp #1864 is the 2003, 2011, and 2012 Alabama Division Camp of the Year. It is named for Fort Blakeley, an area located in Bay Minette, Alabama that was the site of a battle late in the war. "Probably the last charge of this war, it was as gallant as any on record."